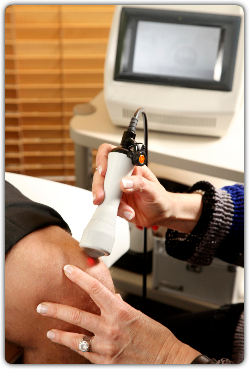 Lake Country Health Center prides itself for the utilization of the latest, safest class IV laser therapy technology. 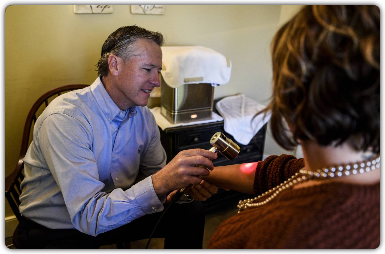 Laser Treatment, also known as, Low-Level Laser Therapy, is a effective, fast, and cost effective treatment used for a variety of soft-tissue injuries along with pain and inflammatory conditions. The FDA approved application of laser for the treatment of pain and stiffness associated with arthritis stimulates cellular metabolism and enhances biochemical functioning. Cold lasers transfer photons of light into your cells. The light energy passes through the skin layers to reach the cells and tissue causing the pain and inflammation. The body transforms this light energy into biochemical energy and the mitochondria then utilize this energy to enhance of facilitate healing. This results in an increase of blood flow while stimulating repair of tissues and reduces pain. As more energy is available, your cells utilize that fuel to function more efficiently. Cold laser complements and can enhance the healing effects of chiropractic, soft tissue manipulation, massage, acupuncture & detoxification. Laser treatment is brief taking only minutes meaning you get back to your day faster. The total number of treatments is generally 8-15 depending upon many factors which will be evaluated by Dr. Murray, Dr. Meye, and Dr. Reimer. It is important to remember that an immediate relief of pain does not mean the condition is fully healed. So, if a course of therapy is suggested, completing all of the treatments will improve your chances of long term success. Different patients will benefit from different types of treatment options. Dr. Murray, Dr. Meye, or Dr. Reimer will determine the best combination of treatments for each individual patient.